On a whim (and by on a whim I mean about a 5 days before), Sarah suggested that we gather a group and travel out to Coney Island. I went there once last summer and was eager to go back. The weather seemed as if it would be perfect, sunny and 60s. I didn’t quite think through the weather, assuming that a sundress would be the perfect attire. Chill aside, the weirdness of Coney Island is not to be missed. It took us a solid hour to get there, even getting lucky with the trains. From Greenpoint to Coney Island is basically traversing the entire axis of Brooklyn, a surprisingly large place. 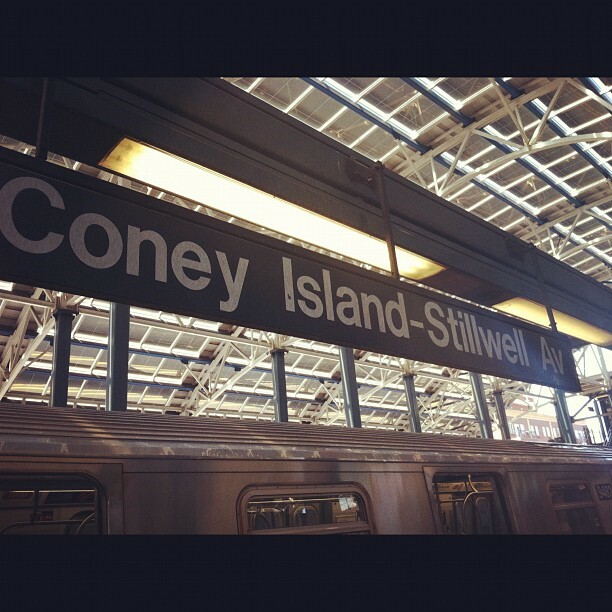 The Coney Island-Stillwell Ave stop is the end of the F line located in a brilliantly old fashioned looking above ground station. 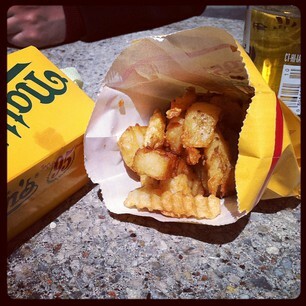 Our first stop was Nathan’s, home of the infamous hot dog and crimpy fries. As a group, we must have gone to Nathan’s at least 5 different times during the day. I think the best I had was the bacon-cheese fries. So greasy and terrible that they were perfect. We sat outside Nathan’s for about an hour waiting for everyone to make it down. In that time I think we were harassed by at least 10 different homeless people. On the outside wall, Nathan’s is counting down to their annual hot dog eating contest on the 4th of July. I doubt that I will make it down there for it, but it did make me excited to count down for summer. The beach was not very crowded. Most likely because it was not exactly beach weather. But it felt great to be out in the sun again and having fun with my friends. There was a man with two large parrots and a giant python selling pictures on the boardwalk. After spending a little bit of time on the boardwalk, we headed for the rides. First stop, Deno’s Wonder Wheel. It isn’t a Ferris Wheel exactly as the cars are not attached to the outside of the wheel. So they sway. Which is slightly terrifying. I left my phone with the non-Wonder Wheel Rider’s, so I unfortunately don’t have any pictures to show. But from the top, we could see all the way to the Empire State building, about fifteen miles away. We could also see the Verrazono bridge, spanning the distance between Brooklyn and Staten Island. If you are afraid of heights or roller coasters, I would suggest waiting for a car that does not swing. But, I found the swinging car exciting and beautiful. 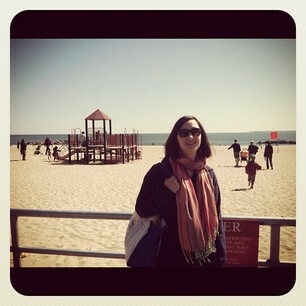 Come back tomorrow for Part II of our Coney Island Adventure. Next Post Shady Side Review Spring 2012!